Become a reseller of a successful ice cream concept? Click for more info! The ice cream concept is an excellent selling opportunity with Ice Delite as a partner. As developer of the ice cream concept, we have the expertise required. We provide resellers with the opportunity to expand Farmhouse ice cream inside as well as outside of Europe. 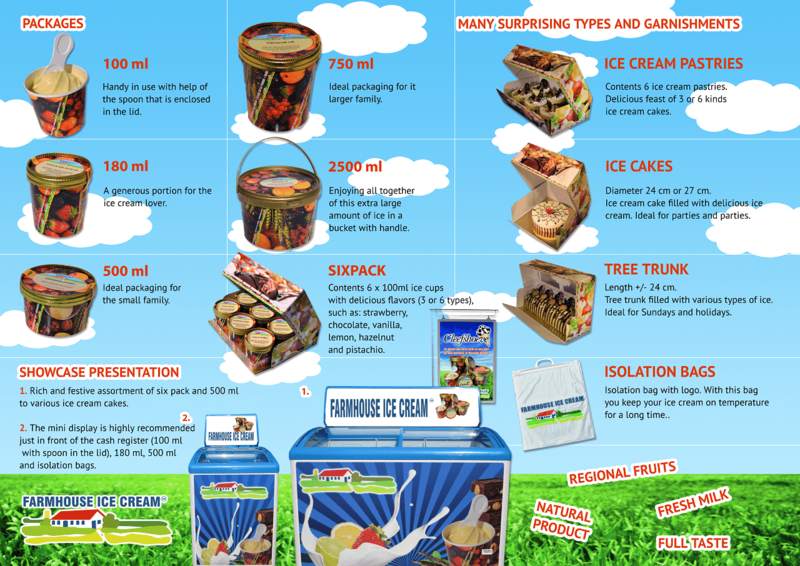 Utilise the possibilities you have in your area and be a reseller of the successful Farmhouse Ice cream formula. The Netherlands is leading in farming with regard to knowledge, food safety and innovation and, therefore, the Farmhouse Ice cream concept fits in perfectly. In line with the concept, we pass on our knowledge about making ice cream to the farmers. When preparing the production room, you will get continued support so that the room meets all demands you will find in the law for food production. Because of the rising demand for regional products and the possibility for farmers to produce natural ice cream on their own farms, the Farmhouse ice cream brand grew enormously. The brand is synonymous with high-quality ice cream. Farmhouse Ice cream is highly valued by ice cream lovers. Restaurants like regional produced ice cream on their menus. Super markets also like to have Farmhouse Ice cream in their assortment. By selling the Farmhouse Ice cream concept, the reseller can easily earn extra profit. It is simple to add the concept to your portfolio. You only have to do what you do best: selling a concept. After the sale, Ice Delite is the customer’s contact. We are working according to the turnkey principle. After delivery of the concept, the buyer can produce ice cream on his own. First, our experts support the buyer in preparing a well-founded business plan. Then, the production room will be equipped in accordance with legal demands and of course, we also provide production trainings. There is no need for the reseller to have technical know-how regarding the production of ice cream. After the sale, we will completely unburden you. You can also count on us to provide marketing support. We will also take care of the complete aftersales procedure. We supply the natural ingredients, support the buyer with commercial training sessions and we provide technical service. You can sell the concept to farmers who want to expand their farm with the production of ice cream. We will also provide support with a large range of tools that can boost sales. Do you want to be a reseller? Contact us! We love to explain the Farmhouse Ice cream concept in a personal conversation. If you are interested in selling the Farmhouse Ice cream concept to farmers in your area, please let us know via our contact form. You do not need agricultural experience in order to sell the ice cream concept. We will meet with you to explain all you need to know about Farmhouse Ice cream. All free of charge!